The star: the spectacular life of Giulio Andreotti, Italian politician and seven time premier during the 1970′ and 1980’s. Italian politics for the uninitiated is complex but that doesn’t mean it can’t be enjoyable and infotaining. Even without a working knowledge of the politics of the time one can still thoroughly enjoy this operatic slice of cinema. There is a punk aesthetic that this film begins with, hitting the viewer with beautifully shot images of various political assassinations of the time. Consequently similarities arise in tone at times to Goodfellas especially in the way characters are introduced and subsequently disposed. 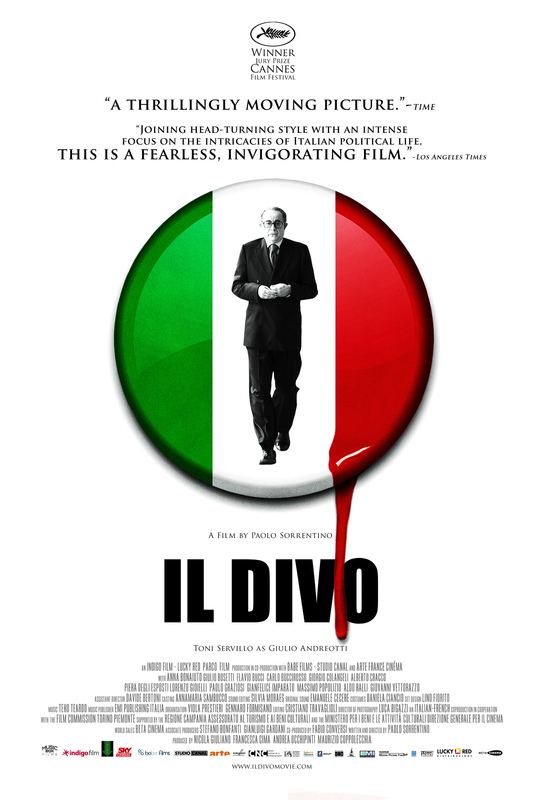 Il Divo confirms that Paolo Sorrentino is one of this generation’s greatest directors. All his Italian films are incredible and thus far he has written not a note out of place. Toni Servillo, his muse, delivers another great performance as Giulio Andreotti, studied, still and sublime. He is De Niro to Sorrentino’s Scorsese and secures his place in the top ten of my favourite actors working today. The soundtrack is always a big part of Sorrentino’s films (like Scorsese) and the last tune of the film seems to encapsulate Andreotti perfectly. Luca Bigazzi, Sorrentino’s trusted cinematographer is back framing the shots with an artistic aesthetic. Why is Fanny Ardant uncredited? I understand the lack of accreditation in La Grande Bellezza as that was literally fleeting but she has a nice scene early on in this film that warrants a credit. Everyone has their reasons for sure but it is a curiosity indeed. And while it is difficult to keep opinions to oneself when it comes to a major politician who supposedly works for you, the people, this quote is filled with a deep wisdom. Remember, just because you don’t follow the minutiae doesn’t mean you can’t enjoy it.